Pictured (from left) Jackie Lane, Steve Andrews, centre manager, Hildreds Shopping Centre, and Collette Parker, from Anglian Water. Artwork made from wet wipes is going on display in Skegness to highlight the importance of keeping drains and sewers clear. The ‘wipes butterflies’ were created by children and adults during sessions held locally by Lincolnshire Community and Voluntary Service (LCVS). They have now been added to a decorative canvas, created by artistic volunteer James Mooruth, for display at Skegness’ Hildreds Shopping Centre. 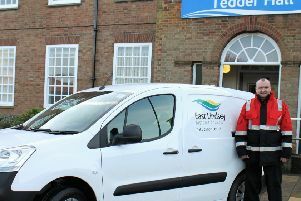 The work has taken place in support of Anglian Water’s Keep it Clear Campaign, which aims to tackle the problem of sewer blockages caused by things such as wipes and other bathroom waste being flushed down the toilet. Along with the creation of the butterflies, the sessions also saw LCVS talk to people about sewer blockages and – supported by the Talk, Eat, Drink project, which improved the lives of older people in East Lindsey – hand out Anglian Water aids and information leaflets. Jackie Lane, LCVS project worker, said: “The sessions to create the butterflies were great fun but had a serious message. We wanted to highlight the small things we can all do to help keep our sewers and drains clear and avoid the misery, cost, bad smells and potential flooding and pollution caused by blockages.